After graduating from Rambert, Adesola began her professional career in New York with The Dance Theatre of Harlem (USA), later guest performing with Union Dance Company and Carol Straker Dance Company (UK). She studied choreography with mentor Bessie Schönberg and created works under her mentorship at Dance Theatre of Harlem. Her choreographic work has since been commissioned and performed across Europe, the Caribbean and North America. As well as site-specific /concert based performances Adesola also makes work for young audiences. Recently she created the young audiences dance performance Light Steps in collaboration with the Turner Contemporary. 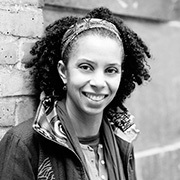 Adesola was awarded the Bonnie Bird New Choreography Award in 2006 and awarded a Trailblazers Fellowship by ADAD (UK). Adesola founded Saltare Foundation for the Arts, Community Dance Center in Long Island, New York for which she was awarded Woman of the Year 1999 for ‘Distinguished achievement in the field of community dance’ presented by the Town of Islip, New York. In 2001 she founded DancingStrong as an umbrella organization presenting original performance work and community based projects. Adesola has taught and created work in Universities and dance academies in UK, Canada, USA, and taught summer schools for Dance Theatre of Harlem as well as being artist-in-residence for art-in-education programmes such as Creative Partnerships (UK) and Learning Through The Arts (CA). She holds a MA, Dance – education and community from Middlesex University and a PhD – the body, dance and society from Canterbury Christ Church University. She has a number of scholarly published works in journals and as book chapters. She is a Fellow of the RSA.